Of course, because this was Interlock’s debut you also get the major bugs in it showing up here. Most particularly, the die-rolling mechanic includes within it a serious screwup: rather than rolling 1D10 plus stat plus skill against a static difficulty number, as in Cyberpunk and other subsequent implementations of the system, you roll that against the referee’s roll of 1D10 plus a difficulty number. The big problem was that the difficulty numbers are on a similar scale here as in Cyberpunk – which means that even someone who has heavily invested in a skill could fail at the easiest rolls associated with it more than half the time. The other thing about Mekton II is that it still seems to be struggling with its identity. Although it tries to put its roleplaying aspects front and centre, the fact is that it is a fairly thin and shallow RPG joined at the hip with a mecha-based wargame, but the two halves of this chimera are not wholly reconciled to each other. In particular, it feels like a Mekton campaign will inevitably involve a fair amount of mech battles, but it doesn’t really do much to ensure that all the PCs will have something useful to do during said battles. The character creation system doesn’t lock you into generating a mech pilot at all, and indeed in principle it seems fine with you generating such a supporting cast member – but then how are you supposed to remain involved during a battle? You could help the referee by playing some of the enemy units, of course, but there’s still the lasting issue that if the decisive moments of the campaign tend to be mech battles, then your PC is going to feel a little second-rate if they don’t make contributions to those. This is exacerbated by the fact that the prepackaged setting of the Aldol system doesn’t feel like a fleshed-out, breathing world so much as it is a backdrop for military conflict resolved via mecha fights. You could, of course, solve this issue reasonably easily by just having the PCs all play mech pilots, but then you end up with the problem of what they do when they aren’t fighting. One of the reasons Mobile Suit Gundam is so good is that it takes place in a vividly imagined future which feels like an actual society where people live, and the characters have deep and involved lives outside of their piloting. The lifepath system is very good at providing that level of character depth, but the game drops the ball when it comes to providing a similar level of setting depth – and indeed since the lifepath system seems designed to be setting-agnostic, the thinness of the setting is shown up all the more when you put them next to each other – and the lifepath results seem less satisfying as a result. (Compare this to Cyberpunk, where the lifepath system shows up practically unaltered, but where it gives rise to a much more vivid picture of your character because whilst the Cyberpunk setting is quite generic when it comes to concrete details, it is extremely rich when it comes to atmosphere and attitude). The last major issue I have with Mekton is the mecha themselves. It is natural that for the purpose of a mecha-duelling game that your mecha-building system is going to be somewhat detailed. However, by putting at least as much (and arguably more) system emphasis on mecha creation and customisation as they do on character creation, and because your capability at operating your mech depends in part on your character’s abilities, in practice the result is substantially more complex than a mecha wargame with no roleplaying element or an RPG with no mecha-designing aspect would be. It’s fine if you want a campaign which just strings together a bunch of mecha fights with everything else as having a decidedly secondary priority – but that’s not how the better mecha anime series work. Subsequent releases would double down on the depth and complexity, pandering to the gearhead tendency of the fanbase but making subsequent supplements more inaccessible since they tended to assume you were using the advanced mech creation system in the Mekton Techbook. This included products like the Mekton Mecha Manual, which provided a bunch of pregenerated Mektons and would have been most useful to folk who don’t fancy generating their own except it requires the Techbook to make full use of it – and that’s the supplement that people who don’t want to design their own mecha are least likely to own. The subsequent edition, Mekton Zeta, kept on a more complex course; the Kickstarted new edition, Mekton Zero, supposedly is going to steer the game back in a less rules-heavy direction, but it’s four years late and whilst Pondsmith claims to be continuing to do development, the fact that he’s been fiddling at it fruitlessly for nearly half a decade like a kid moving food about on the plate in the hope that it will somehow look more appetising from a different angle doesn’t give me enormous confidence in the project. With Cyberpunk being the monster hit it was, Mekton didn’t get an enormous amount of support. R. Talsorian put out Operation Rimfire, a campaign based in the Algol setting which is perhaps the most interesting supplement for it, since it seems to give some insight into how R. Talsorian envisioned the game would actually be used. The end result is highly railroady and seems to be joined at the hip with a decidedly misguided attempt to construct the campaign like an anime series, right down to having the same number of “episodes” as an anime would have. The episode breakdowns are simultaneously extremely linear and very sparse, to the point where it’s really not clear how you are meant to fill the time until you remember that all of this is meant to be a backdrop for a bunch of mecha battles. On the whole, I am kind of left feeling that – as with Cyberpunk – Mekton was a success for R. Talsorian primarily because of their “first mover advantage”. Like Cyberpunk, Mekton was the first attempt to make an RPG focusing on this particular genre, and people bought into that idea first and them wrangled the system to try and make it work for them (or just ignored it). 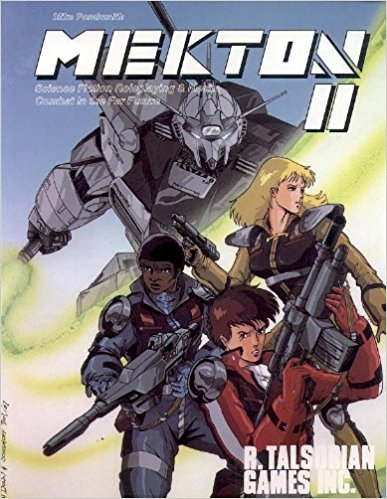 Unlike Cyberpunk, however, Mekton has not had many competitors over the years – there was the Robotech RPG from Palladium Games, and that’s it in terms of things which have caught on. Possibly that’s because mecha anime has ended up being more niche and less influential than cyberpunk, or possibly because the mecha issue incorporates serious issues for RPG gameplay which neither Mekton nor Robotech nor any other game has managed to adequately solve as yet.